Dr. Gates and Dr. Capozza are both members of the American Dental Association, Ohio Dental Association, and Cincinnati Dental Society. Recently, both doctors were recognized as “Top Dentists” in Cincinnati, as published in Cincinnati Magazine. Dr. Gates was born and raised in Landen, Ohio. He is a graduate of Archbishop Moeller High School where he was a member of the swim team. Dr. Gates completed his undergraduate education at Miami University and was a member of the water polo team. He then followed in his father’s footsteps and enrolled in dental school. Dr. Gates received his Doctor of Dental Surgery from The Ohio State University College of Dentistry. After graduating from Ohio State, Dr. Gates continued his education by completing a general dentistry residency at Denver Health Medical Center in Denver, Colorado. 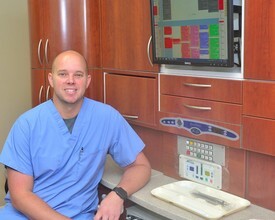 Dr. Gates joined his father at Gates Family Dentistry in 2008. From 2008 to 2015 father and son worked side by side growing their practice. In 2016 Dr. Gates took over ownership and management of the practice upon his father’s retirement. Dr. Gates and his wife Katie live in the area with their three young children. They enjoy spending time together outdoors as a family and participating in the kids’ school and extracurricular activities. Dr. Gates is a proud supporter of the Kings community. Dr. Capozza is originally from Spring Hill, Florida and attended the University of Florida. 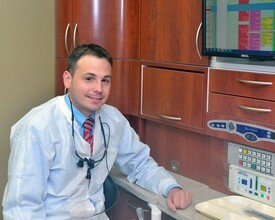 While at Florida he completed both his undergraduate and dental education, graduating from dental school in 2011. In 2012 his wife, Lauren, started a dental residency at Cincinnati Children's Hospital, which prompted their move to Ohio. They have two sons and in their free time they enjoy watching sports (Go Gators! ), cooking, camping, church activities, and going to the Cincinnati Zoo. Dr. Capozza is also passionate about continuing dental education and has guest lectured for pre-dental and dental hygiene students at the University of Cincinnati.